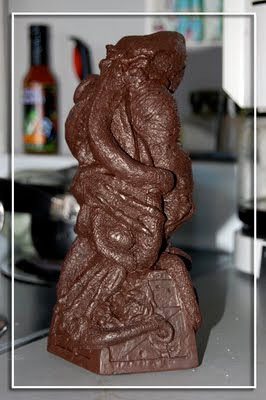 A few weeks back I was painting a custom cthulhu statue for a client, and after priming it I had base-coated it a dark brown in order to give it an aged bronze look. Maybe it was the way the paint was drying, but it looked exactly like dark chocolate- my favorite! I mused about casting them in chocolate- and the prank was born. If you didn't see the blog entry, click here - be sure to click on the fake Paypal button for the reveal. The response to the joke (public and private) was larger and more positive than I had expected. So, now I am seriously working on Chocolate Cthulhus! A new sculpture is being created, and the nightserpent test kitchen will be opening soon. There goes my trim figure for beach season!! Don't mess with us again Paul...make these things! Taking into consideration the elements they've, think of yourself as pleased to concur particular much more dollars, anytime essential. It would show itself like a one-time monetary dedication. replica hublot You might too think it is just about all like a pleasure intended for anyone. replica hublot Particular illnesses or just difficulties will require some kind of MRI which will see concealed problems. MRI is called magnets resonance image resolution. hublot replica A great pc expert from the radiology region typically performs the actual test. rolex replica Understand factors in order to wish as well as how to you'll find the actual surgical treatment prior to your conference. replica watches Other than whenever your doctor advices everybody otherwise, you can really consume generally as well as need your regular medication replicate 1 guide exercise.